Sometime in the last few months, the words “I’m never doing a formal family session ever again” came out of Ryan’s mouth. With the exception of our wedding and reception, Ryan and I have had heated battles right before our sessions. 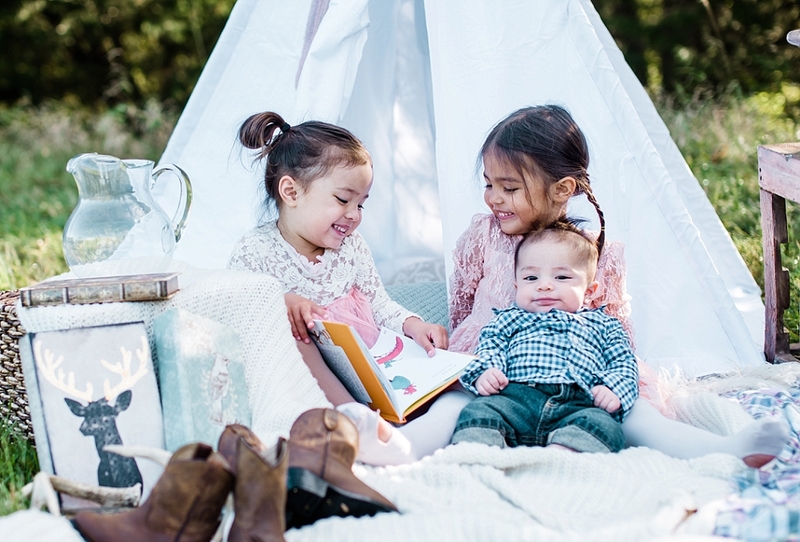 As a photographer, you would THINK that I could get my family in a relaxed state before the session – I mean, I’m like the toddler/husband whisperer for my own clients. Nope. Not for my family – my family is nuts. I love them anyway. Anyway, I wanted some photos for our Christmas cards this year. I planned a fun shoot for the kids on a day I KNEW Ryan would be hunting. I didn’t even bother to tell him that we were doing a shoot until a day before. I planned on bringing a TON of props, and if I would have told him all that I planned, I knew I wouldn’t hear the end of it. So I planned this session WITHOUT him. The day that I revealed that we were doing a fun kids shoot, he was persistent on wanting to be there. I told him he didn’t need to be there because it was a session specifically for our kids. I somehow snuck in a reminder of how I took his thoughts into consideration about him not wanting to be in any more formal photos. He didn’t say anything in response. Amazing! So ladies, if you need to somehow convince your spouse to do something….reverse psychology works! The unbelievably talented Laura Morsman captured the five of us in a fun session at Shawnee Mission park. As a photographer myself, I can definitely say she is beyond talented and has an amazing eye! 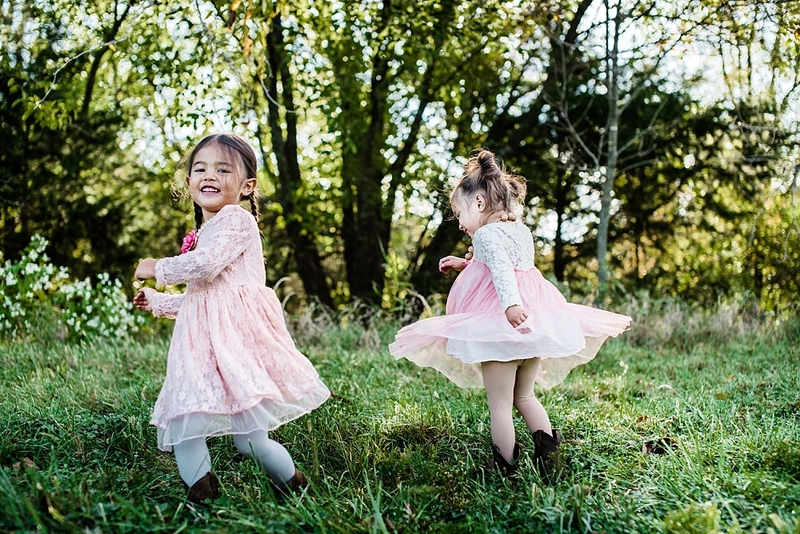 I think she’s doing mini sessions this fall – so check out her site at www.lauramorsmanphotography.com! Like I said, if you are my client and you start using her, I would totally understand. For this session, I randomly took a bunch of home decor items I had to style it. Random, I know. 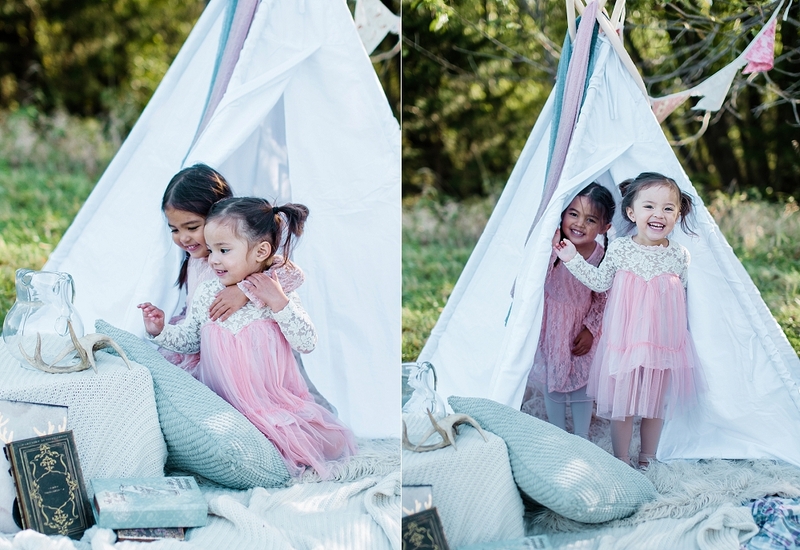 I purchased a teepee specifically for this shoot because I knew it was the “shiny new object” that would keep the girls entertained and smiling! The look I was going for was “glamping“, if you will. Can you tell from Ansley’s smile my teepee “distraction” technique/idea worked? The below image captures this beautifully, our girls are so in love with their little brother. This child is going to be spoiled. I have a feeling that when he grows up, any girl who falls for my little boy will have to get the approval from his big sisters. Can you believe it?! Real smiles y’all! I’m so blessed and so in love with my little family. Ryan didn’t even say a word about the props… Okay, he said something about the teepee, but he didn’t drone on and on about it like he usually would have. I’m thinking about other ways I can use reverse psychology on him now! 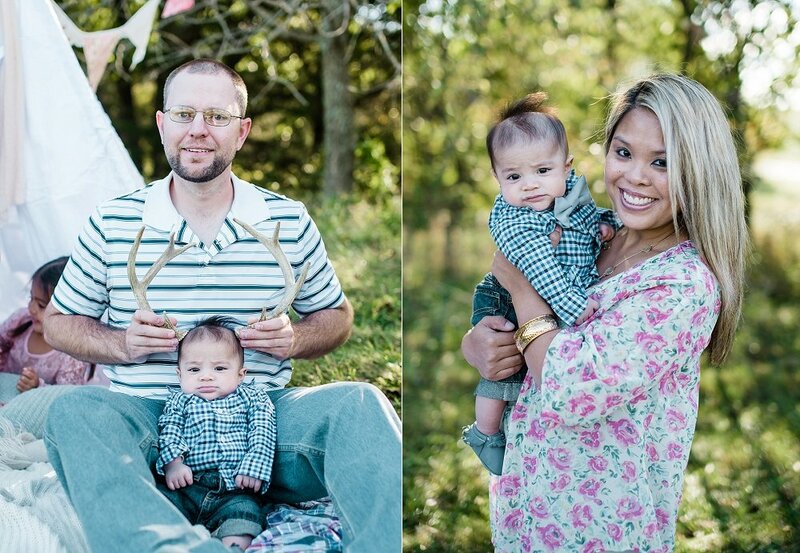 I incorporated some of Ryan’s antlers because I wanted some sort of rustic feel to the session. ” And this is what he does with them. Totally Ryan’s idea, not Laura’s. Wanted to make sure everyone knew this corny idea was ALL Ryan’s! Not sure what joke was being told, but apparently it was so hilarious, Ans decided to laugh into the blanket! I loved how Laura made my girls feel at easy. I love them twirling their dresses around! My better and crazy half. 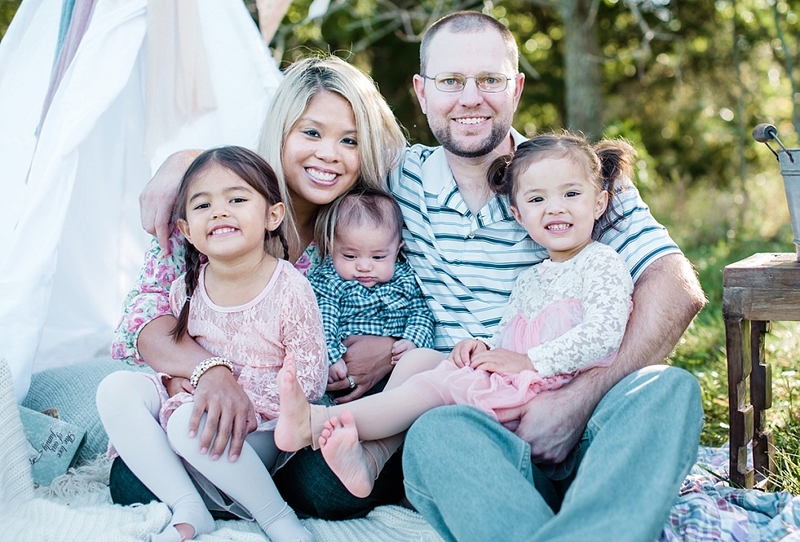 Not sure how we we ended up with three kids in a span of four years, but I’m excited for the rest of our journey together. Thank you Laura Morsman. You are incredibly talented, and I thank you for capturing our memories for us. 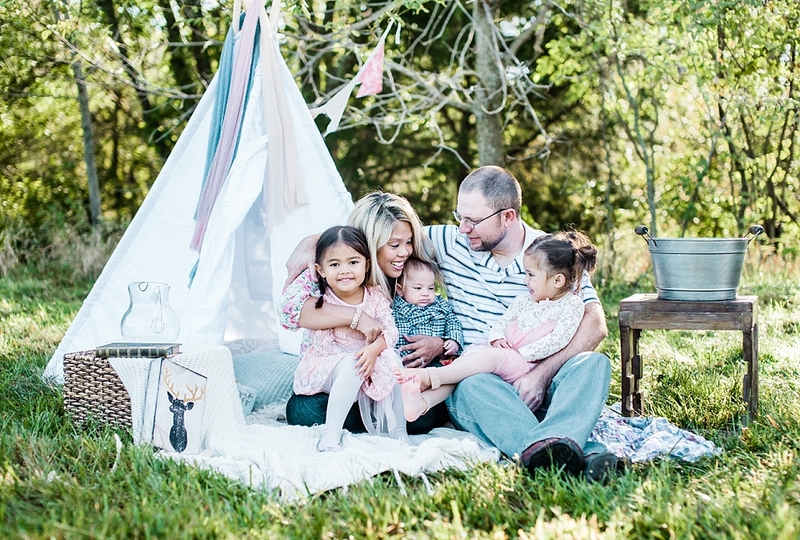 You have a beautiful family and I am in love with this glamping style family shoot!